Marvin Ronald Hubbard (May 7, 1946 – May 4, 2015) was a professional American football player. He played fullback for the American Football League's and later National Football League's Oakland Raiders from 1969 through 1976, and the Detroit Lions in 1977. He was a 3 time NFL All-Pro for the Oakland Raiders, and helped lead the team to four consecutive AFC Western Division titles from 1972-1975 and three consecutive AFC Conference Championship Finals from 1973-1975. Hubbard is ranked fourth in NFL history for highest yards per carry (4.82) for a fullback (behind only Hall of Fame fullbacks Marion Motley, Jim Brown, and Joe Perry), and is tied for 13th overall highest yards per carry in NFL history. Hubbard grew up in Red House, New York; residing in the hamlet of Bay State, Hubbard graduated high school shortly before the state forced most of the private property owners in the town to turn over their land, but he and his family were able to avoid losing their homes and he continued to own their family properties in the town until his death. He attended Randolph High School in rural Randolph, New York, near Jamestown. Following high school, Hubbard attended prep school at the New Hampton School. After high school, Hubbard attended New Hampton School and then Colgate University in Hamilton, New York. At Colgate, he lettered three years, leading the team in rushing in 1965 with 665 yards and 1966 with 893 yards, at the time the second-highest total in Colgate history. In 1966, he was 13th in the nation in rushing and scored 88 points, sixth-highest in the nation. He ended his career as the second-leading rusher in Colgate history with 1,887 yards and 22 touchdowns. He graduated from Colgate in 1968. In 1995, Hubbard was inducted into the Colgate University Athletic Hall of Honor. 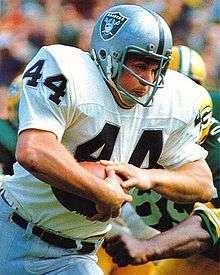 A fullback wearing the silver and black #44, Hubbard initially signed with the Oakland Raiders in 1968, but was released in preseason cuts, due to an initial inability to adjust to the professional game; an attempt to stick on the Denver Broncos' roster led to a similar result. He then signed with the Hartford Knights of the Atlantic Coast Football League, where, despite not being the team's full-time running back, he still led the league in rushing yards (with his tandem partner, journeyman Mel Meeks, finishing a close second). After Hubbard's success with the Knights, the Raiders exercised a reserve clause in his previous contract and signed him to their active roster. Hubbard averaged 4.82 yards per carry during his professional career, which ranks fourth all time for an NFL fullback (behind only NFL Hall of Fame fullbacks Marion Motley, Jim Brown and Joe Perry) and is tied for 13th for all-time top yards per carry for any player in NFL history. His career yards per carry average was higher than many of the games legendary running backs, including: Walter Payton, OJ Simpson, Eric Dickerson, Emmitt Smith, and Marshall Faulk. Hubbard was a standout at the starting fullback position for the Oakland Raiders from 1971-1974 and part of 1975, and gave Oakland's fearsome air attack a balanced running threat. He helped lead the Raiders team to four consecutive AFC Western Division titles from 1972-1975 and three consecutive AFC Conference Championship Finals from 1973-1975. Hubbard led the Raiders in rushing four straight seasons from 1971-1974, and averaged over 1,000 total yards from scrimmage per season during those four seasons. He gained 1,100 yards rushing during the 1972 season, becoming the Raiders all-time single season rushing leader at the time. He rushed for a total of 4,544 rushing yards, 3,755 of which came during his four full-time years from 1971-1974. Hubbard was named to the NFL's AFC Pro Bowl Team in 1971, 1972, and 1973. Hubbard scored 24 touchdowns (23 rushing, 1 passing) during his career, six of which were against his favorite opponent, the Kansas City Chiefs. Hubbard was featured on the cover of Sports Illustrated on December 17, 1973 after the Raiders won a pivotal game over the division rival Chiefs. Marv kept an enlarged graphic of that magazine cover in his office throughout his post-football career. He was also an effective pass receiver coming out of the backfield, and caught 85 passes for 624 total yards, averaged 7.4 yards per reception. According to John Madden, he also used Hubbard on kick-off and punt return teams where "Marv turned from a fullback into a linebacker". Multiple shoulder injuries sidelined him for part of 1975, and Hubbard spent all of the 1976 season on injured reserve. He received a Super Bowl ring for being a team member of the 1976 season Super Bowl Champion Oakland Raiders team (January 1977 Super Bowl XI). In 1977, He signed with the Detroit Lions, where he saw reduced play, then retired. Marv was a professional country musician and songwriter for a brief period after football, and released the single "Fullbacks Ain't Supposed to Cry" in 1978. He also released the tracks "Legend in His Own Mind/Country Boogie" in 2009. Hubbard loved to golf and frequently donated his time and autographed memorabilia to charity celebrity golf tournaments. In 1975, Hubbard and Sal Bando, a third baseman for the Oakland Athletics, won the American Airlines Golf Classic, which featured pro football and baseball stars as partners, in Palm Springs, Calif.
On September 27, 2003, Hubbard was involved in a car accident in Castro Valley, California, in which the driver of the other car was killed. In 2004, Hubbard pleaded no contest to misdemeanor DUI. The driver who died had been making an illegal turn in a "blind spot" on an isolated section of road. Hubbard died on May 4, 2015, just 3 days shy of his 69th birthday, from complications of prostate cancer. Hubbard had a wife of 49 years, two children, and five grandchildren. At the time of his death, he lived in Northern California and still owned the family properties in Red House. 1 2 Danny Spewak (14 September 2014). "New York's Smallest Town Still Holding On". WNY News. ↑ "Sixty minutes with Marv Hubbard:A Raider's reflections on today's NFL, the old days, and coming back homePart three of a three part series". The Salamanca Press. 1 2 Dr.Ken (April 2010). "Somewhat forgotten, Marv Hubbard". helmethut.com. Retrieved July 10, 2015. 1 2 "Colgate University Raider Athletics". gocolgateraiders.com. ↑ "Charges unlikely against ex-Raider / Man killed in crash with Hubbard made illegal turn, CHP says". SFGate. ↑ "CHP report on fatal accident involving ex-Raider due today D.A. considers charges; Blood-alcohol test results due later in week". highbeam.com. ↑ "HAYWARD / Ex-Oakland Raider pleads no contest". SFGate. ↑ "Marv Hubbard, former Oakland Raiders running back, dies at 68". ESPN.com.